You don't need fancy equipment for good quality baked goods, but some tools and techniques will definitely make your life easier. Here is a quick inventory of the items I almost always use when baking some of the goodies you see in this blog — please note that I am not being sponsored by any of these brands or stores that I mention! All opinions, thoughts, and recommendations are exclusively my own. I’ve owned this mixer for many years now, and although the mixer is not without flaws, I will say that it's made my life in the kitchen SIGNIFICANTLY easier. I can barely remember life without it. It truly is a workhorse in my baking life, and I don’t even have that many attachments! 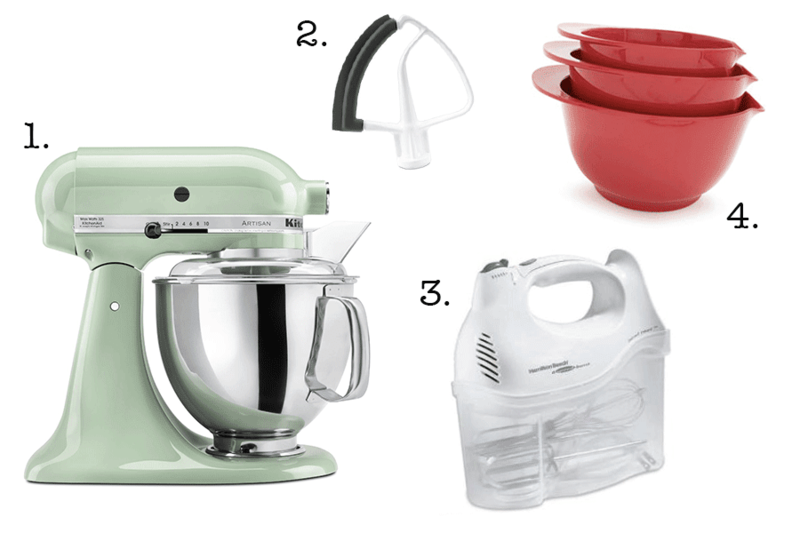 A note on the model — I own the KitchenAid Artisan series because I was seduced by all the pretty colors available, but really, any freestanding KitchenAid mixer model will do. I've heard from other bakers that their Professional series is actually far superior to the one I own, so that might be worth checking out. I waste my money on a lot of things I really don't need, but I can honestly say that the Kitchen Aid Flex Edge Beater is NOT a waste of money. The KitchenAid Flex Edge Beater has a spatula at one side of the flat beater, which scrapes down the side of the bowl as it mixes and eliminates the need for you to stop the mixer and do so, producing evenly mixed batters with the most minimal amount of effort. It's saved me a countless number of minutes and an indescribable amount of energy. There's a non KitchenAid version of this beater that's well reviewed on Amazon and significantly cheaper, but I shied away from this one because KitchenAid does not honor defects caused by non-KitchenAid attachments. But by all means, if you're willing to do so and save a significant amount of money, I recommend getting the New Metro beater. 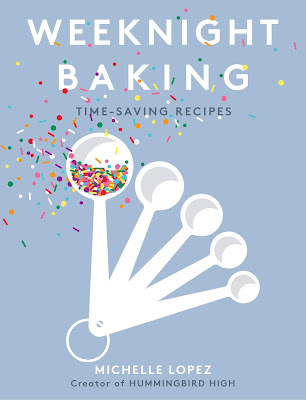 A tool like this — whether it's by KitchenAid or New Metro — really makes a big difference in the baking process. Prior to getting my KitchenAid mixer, I was using the rather unsexy but highly dependable Hamilton Beach hand mixer you see above. I bought it my sophomore year of college (at a Safeway, of all places! ), but it's still got full power and yet to fail me. It's cheap, works well, comes with 3 different types of beaters, and most importantly, it's lasted. I like mixing bowls that are deep (the deepness will keep more splatter in if you're using a hand mixer) and have spouts that allow you to easily pour its contents. These mixing bowls from Sur La Table are a great deal and come in three handy sizes. Serious bakers use scales, not measuring cups, to measure out their ingredients when baking. According to Michael Ruhlman's Ratio, a cup of flour can weigh anywhere between 4 and 6 ounces, depending on various factors such as how tightly you packed in your ingredients, how much humidity there is in the air, etc. Weighing your ingredients is the best and most consistent form of measuring. I rely on the Escali digital scale for whatever measuring I might do, and its weight toggles between pounds, ounces and grams. I much prefer metal measuring spoons and cups to plastic ones simply because they're far more durable. I had a garbage disposal in my old apartment in San Francisco, and my plastic measuring spoons would sometimes fall in the disposal and come out completely shredded by the machine. Yikes. I like this particular set because it comes with a handy ⅛ cup measure. The square shape of these measuring spoons allows you to easily stick each spoon in a round spice jar without any hassle! Again, I like this set because it comes with the ever elusive ⅛ measure. Unfortunately, it’s lacking the ½ tablespoon measure (which recipes don’t often use, but it’s still a nice to have). Liquid and dry measuring cups are different and that the appropriate measuring cup should be used for each ingredient. 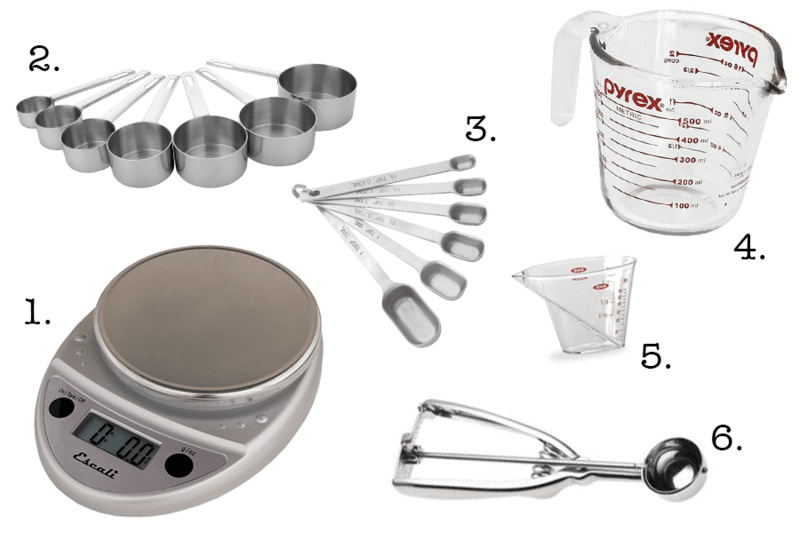 Specifically, liquid measuring cups have a handle and a lip — like the Pyrex ones above! They must be set flat and level on a counter before filling to the desired mark; bring your eyes down to the cup level to see that it is properly filled. Pyrex makes cheap, durable measuring bowls that come in a variety of sizes. Same deal as above, but this little baby is for those pesky tablespoon measurements that recipes sometimes instruct you to do. This guy is only 3 inches tall and has measurements available in cup, tablespoon, ounce, and mililiter markings. Before I bought this scoop, I was using spoons to scrape batter from my mixing bowl, dripping it everywhere. I cannot tell you how much this scoop has made my life easier! Even though it's supposed to measure out cookie balls, I use this tool to scoop batter into cake pans and measure out cupcake and muffin batter. It's seriously a game changer. I also use it to measure out frosting onto each cupcake. I use a silicone rubber spatula almost every time I bake for mixing, scraping, spreading and more. This particular spatula is sturdy and unibody, as well as dishwasher safe. Also, it comes in several cute colors! Ever wondered how to frost a perfectly smooth cake? 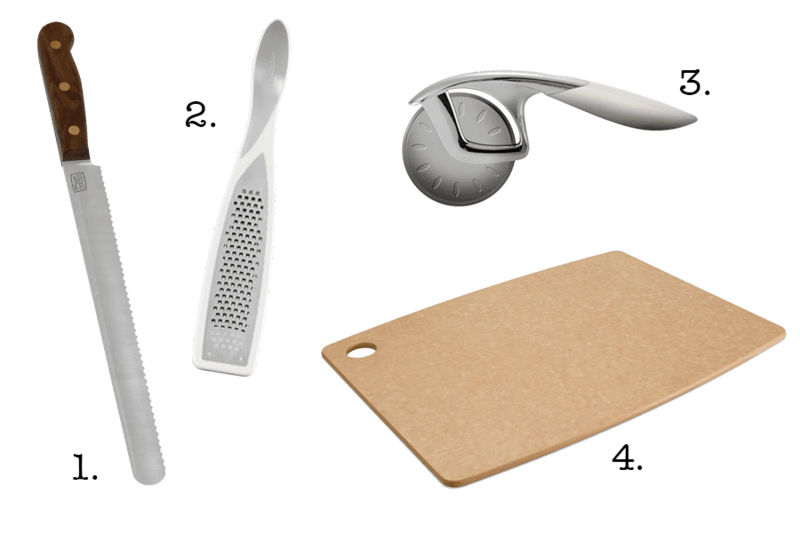 The offset spatula is your answer. Perfect for frosting cakes and smoothing out batters. This bench scraper is another workhorse in my kitchen, especially when I’m working with bread and pastry dough. A bench scraper can also help you frost a perfectly smooth cake! Wow, I’ve mentioned frosting a perfectly smooth cake several times now, haven’t I? Along with an offset spatula, it really helps to have a revolving cake stand. This one from Ateco is one of my favorite kitchen tools — sturdy, utilitarian and so perfectly made that it could keep spinning forever and ever. Really. I use a serrated knife for all my pastry and baked good slicing needs. This one by Chicago Cutlery is really, really good quality for its price — you don’t need to spend any more than $20 for a good serrated knife, I promise. I use this hand grater to grate cheeses and fruit zests, primarily. The hand grater has a nifty little compartment that catches whatever you're grating, preventing any mess. Plus, it comes in several cute colors! 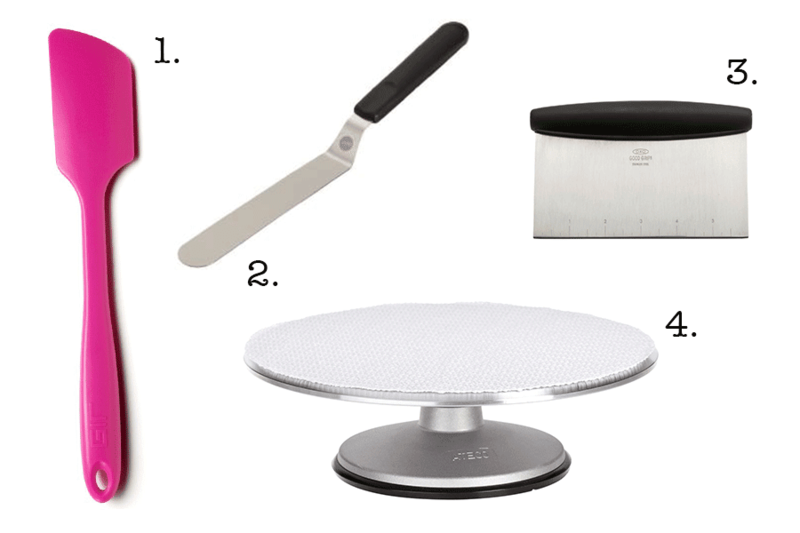 I’ve used this pizza wheel to cut pies, galettes, cookie bars, brownies and more. Another great tool for slicing and dicing. A cutting board you can stick in the dishwasher and that has yet to warp or fade in quality even after three years of everyday use. A cooling rack is one of those tools that I never thought was necessary until I got one myself -- they allow for quick cooling, and really help in preventing baked goods from overcooking in their tin or becoming soggy. I highly recommend this Crate & Barrel rack because, not only is it relatively cheap, it's also one of the most sturdily constructed cooling racks I've ever come across. Most other cooling racks that have round wiring, this cooling rack's slats lay flat on top, providing a better surface for your baked goods to rest on. Plus, it's non stick! I store all my pantry ingredients like flour and sugar in these airtight plastic jars. Unlike traditional mason jars, these jars have wide mouths which allow you to scoop whatever’s inside fairly easily. Plus, they’re super attractive when filled and lined up in your kitchen cupboards! 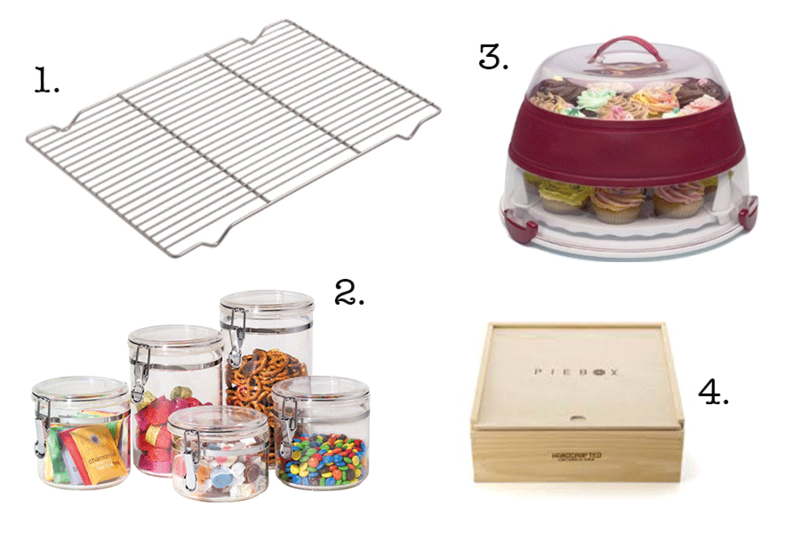 This carrier allows you to store and transport your cupcakes without any hassle or mess, with tiered levels and special cavities for each cupcake. Best of all, the tupperware collapses into itself, allowing for easy storage. A relatively new addition to this list, a friend got me a pie box as a Christmas present and it’s proven itself to be incredibly handy. More compact than the cupcake carrier, the pie box is sized perfectly for 8- to 9-inch round baked goods, preventing whatever dish is inside from slipping and sliding during transport. Plus, it comes with an absolutely gorgeous leather strap. I always get double-takes when I’m carrying this pie box around. Providing websites that offer a good selection of coffee espresso machines that can be used in your home. These sites offer brand names Be sure to read the details and features of each coffee espresso machine you check into. 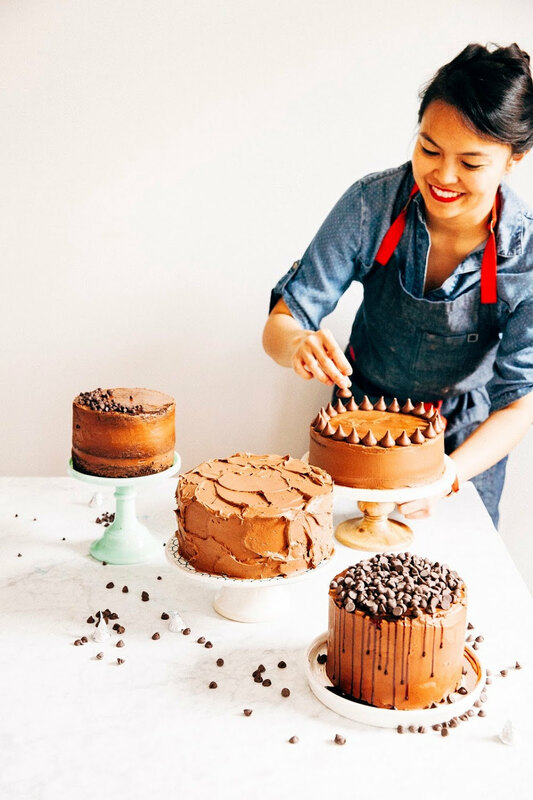 Hey Michelle, do you ever use cake boards for your full-size/larger cakes? Do you have any suggestions for reusable ones, or have you ever heard of any good ones? The site is really info is very great and it was a cordial posts and providing the different info is visible in this blog. Helpful posts, this is really admired for the great technology in this blog and writing the different articles are visible in this blog. I am very much happy for suing the different articles in this blog and using the nice technology in this blog. Amazing, I liked your article which share the essential equipment for cooking and kitchen. Thanks for sharing it with us.